Ana Paula Höfling holds a PhD in Culture and Performance Studies and an MA in Dance from the University of California, Los Angeles, an MFA in Dance from the University of Hawai`i at Manoa and a BA in Linguistics from the University of California, Berkeley. Prior to coming to UNCG, she taught at Wesleyan University, where she was an Andrew Mellon Postdoctoral Fellow, at the University of Wyoming, and at the Academia Superior de Artes de Bogotá in Colombia, where she was an IIE Fulbright scholar. She is a Royal Academy of Dance-trained ballet dancer and a capoeirista, having studied with Mestre Acordeon, Mestre João Grande, and since 2005, with Mestre Jogo de Dentro and the Grupo Semente do Jogo de Angola. 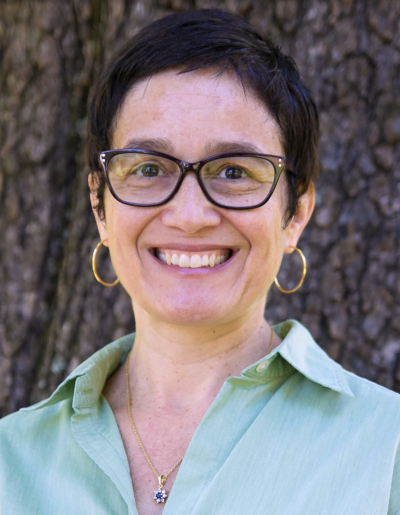 Her book, Staging Brazil: Choreographies of Capoeira (Wesleyan University Press, forthcoming), analyzes the role of capoeira and capoeiristas in the process of staging Brazilian “national culture” between 1928 and 1974, focusing on issues of race, class, and authorship. Her recent articles on capoeira include “Capoeiras of Bahia“ in Axé Bahia: the power of art in an Afro-Brazilian metropolis (Los Angeles: Fowler Museum, 2017) and “Staging Capoeira, Samba, Maculelê and Candomblé: Viva Bahia’s Choreographies of Afro-Brazilian Folklore for the Global Stage” in Performing Brazil: essays on culture, identity and the performing arts (University of Wisconsin Press, 2015). Her article “Pedagogy of the possessed: re-thinking the dancer-researcher-performer (BPI) method in dance curricula in Brazil” is available in both English and Portuguese in the open source Brazilian Journal on Presence Studies. Vol. 6 No. 2, p. 287-307, May-Aug, 2016 (http://seer.ufrgs.br/index.php/presenca/article/view/58130/37190(opens in new window)). Her book review essay “Dancing Latinidad: Spinning a World of Salsa Scholarship” was just published in the latest issue of the Latin American Research Review 53(3): pp.666-670. https://larrlasa.org/articles/236/. Her new research interests include representations of mestiçagem in early twentieth-century ballet in Rio de Janeiro, and the choreographic production of Eros Volúsia, Mercedes Baptista, and Felicitas Barreto. She is a member of the Dance Studies Association, the Brazilian Studies Association, and the Latin American Studies Association.